Buckle the Sharkbanz around your ankle securely but comfortably. Not too tight, not too loose. The Logo can face up or down, whichever feels more comfortable for each person, but the Logo side of the band should be on the outside of the ankle. 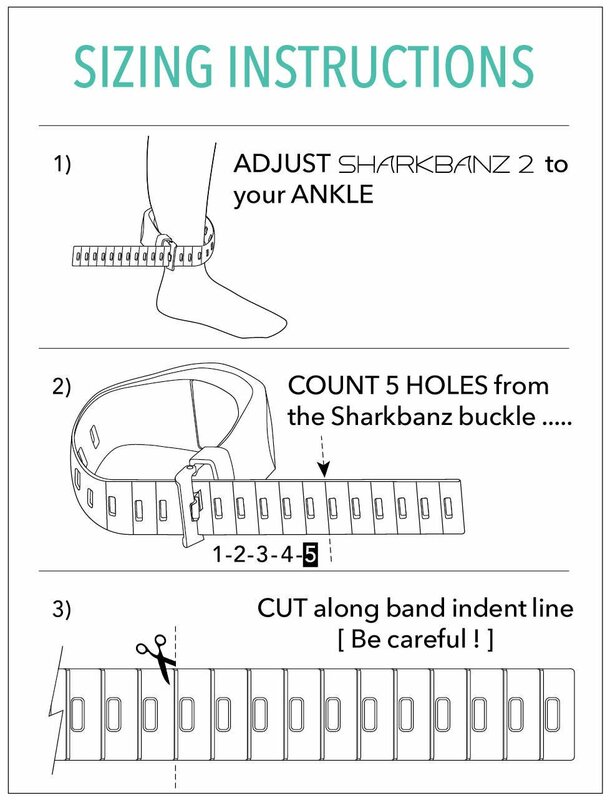 Now your Sharkbanz should be appropriately sized to fit your ankle and wrist without too much excess band hanging off. Discard the excess band in the trash. We thought long and hard about the environmental impact of this, and after analyzing the manufacturing process, discovered that making multiple sizes would have resulted in exponentially more waste than our current sizing solution. In addition, the carbon footprint created by all the transportation required to deal with returns for customers who need to switch sizes would be considerable. We are continuing to innovate this part of the Sharkbanz design for future versions. Wash thoroughly with fresh water after use. Salt water and sand will corrode pretty much anything over time. Dry and return to the Sharkbanz box. You may notice very fine ferrous (iron) particles stuck to your Sharkbanz as it pulls them from the sand. This occurrence is perfectly natural and OK. Your Sharkbanz is not "leaking" nor damaged. These can simply be brushed off with a little elbow grease. DO NOT STORE IN CAR. Temperatures can get too hot in a car and cause damage your Sharkbanz. Don't throw away the Sharkbanz box! We constructed it with durable materials and special magnetic shielding as a storage box for your home and on the go. Keep your Sharkbanz in the box whenever possible to protect electronic devices and the band. 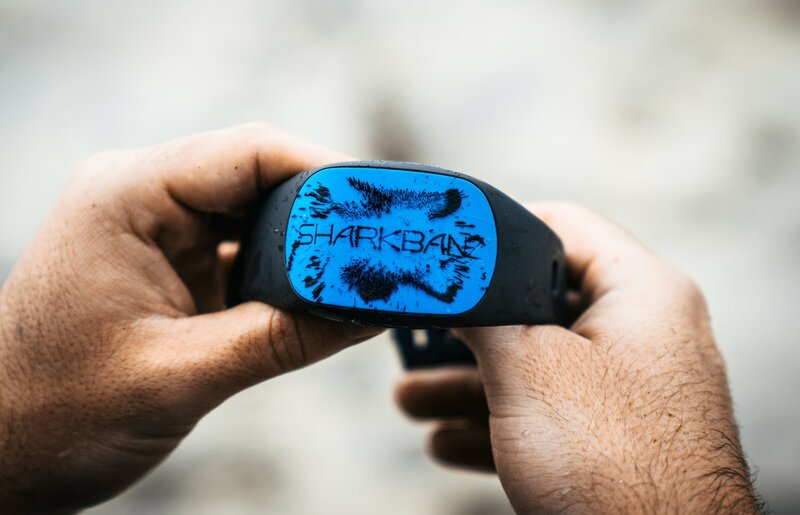 You will notice a significant difference in the presence of the magnetic field when the Sharkbanz is inside vs. outside the box. Enjoy playing around with the magnet, but be careful! We are not responsible for any harm caused to other devices or people. Store your Sharkbanz and the box out of direct sunlight and DO NOT STORE IN CARS, as heat over 140 degrees Fahrenheit (60 degrees Celsius) will damage the magnetic tech. Sharkbanz should be kept in the box while traveling to protect electronic devices in your bags. The magnetic shielding in the box will protect electronic devices in your luggage. Always do your best to separate the Sharkbanz box from electronics, but almost anything will be safe in the presence of the reduced magnetic field. If you are concerned about a specific device, please email connect@sharkbanz.com and we will answer your question. The TSA will not give you trouble over your Sharkbanz. 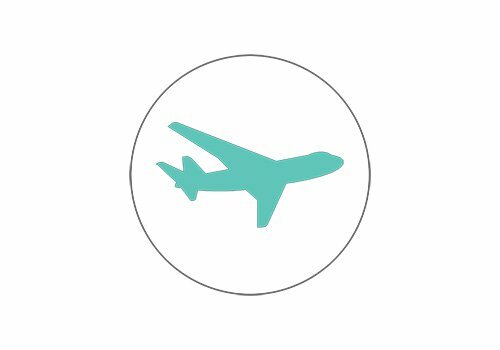 We have traveled to different countries and throughout the US with them and had no issues thus far. This goes for checked and carry on bags. Please note that Sharkbanz' powerful magnetic technology will attract all ferritic (iron) particles. You may observe these tiny particles sticking to your Sharkbanz after an ocean swim (oftentimes appearing like a dark "goo"). Don’t worry! your Sharkbanz is not leaking, nor is its effectiveness reduced. The best way to clean the particles off is to simply use a slightly damp or dry towel and smoothly wipe them away. Did we miss something? Confused? Drop us a line at connect@sharkbanz.com and we'll help you out right away.